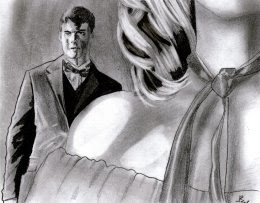 This was the illustration for “Ray The Vampire” on Flash Fiction Online. (http://flashfictiononline.com/) Copyright 2008, R. W. Ware. The artist also replied graciously to my thank you note, and that always sits well with me. The Editor made a Wordle, and this made me laugh. (http://www.wordle.net/) I am SO going to put this on a t-shirt! It might be my new running shirt now that “I Leave Bite Marks” bit the dust. I have decided to take a break in querying for my Ray novel. Thanks mostly to the Twilight series, the market is so saturated with vampire novels that it’s suffocating. Hooray to these authors and their success, but it makes me want to sigh because I loved vampires before vampires were trendy, and now I’ll just have to wait until everybody is satiated of them, and then sick of them, and eventually enough time passes that I can reintroduce my novel and not have the instant reaction be, “Oh no, not another one.” Of course, mine isn’t your typical vampire novel, and it was written before I’d even heard of Twilight, but that doesn’t matter much. And besides, all authors say that anyway, ha.